On our website you will find the widest online selection of plastic materials available in the USA. Our goal is a straightforward online experience with no minimum order quantity and complete plastic customizability. On this page you will find a detailed description on how to order online. If you would rather speak with a customer service representative regarding your order, simply call (800) 474-3688 or email orders@eplastics.com and we will reply as quickly as possible. 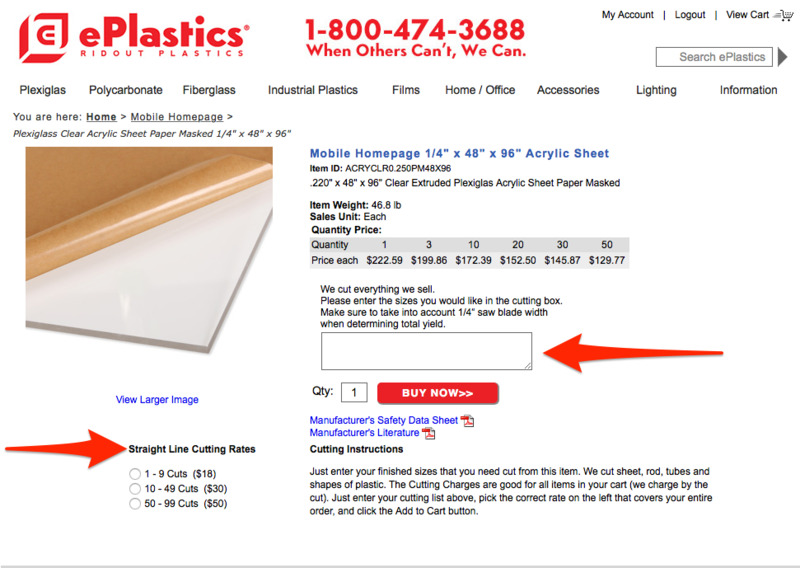 ePlastics.com allows you to select items through the use of a global site search, filters, and various drop-down menus that make finding items simple. As you browse through the items, you will see a button next to each one that says "Buy Now". 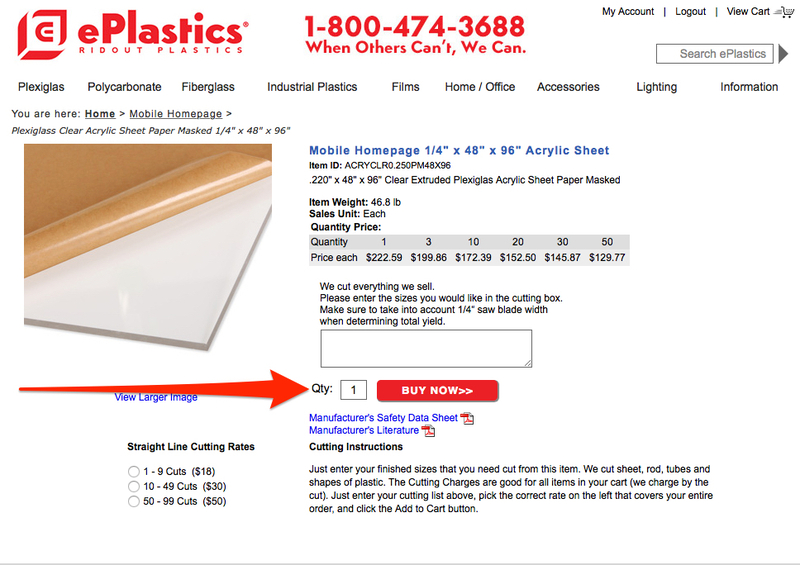 Selecting that button will bring you in to an Item Detail page with pricing information and a cutting box (for applicable parts). On the Item Detail page you will be able to select the quantity you would like to purchase, and input any special instructions for cutting and shipping. Read Step 2 for cutting instructions. If your order requires cutting, read below. If it does not, then skip to step 3. To input cutting information, select the number of cuts that you would like from the Straight Line Cutting Rates button selection (see image below). Enter all of your cutting instructions and dimensions into the cutting box. Be as detailed as possible, and keep in mind our nominal sizing information while measuring your pieces. The information you enter here is read by an ePlastics® employee, not an automated process, so the more details you include the better. Input the quantity you would like to order in the Qty box (see image below). Click "Buy Now" to add that item to your shopping cart, and then review the shopping cart contents. Once you are in the shopping cart, you can review all of your order details and calculate shipping charges. 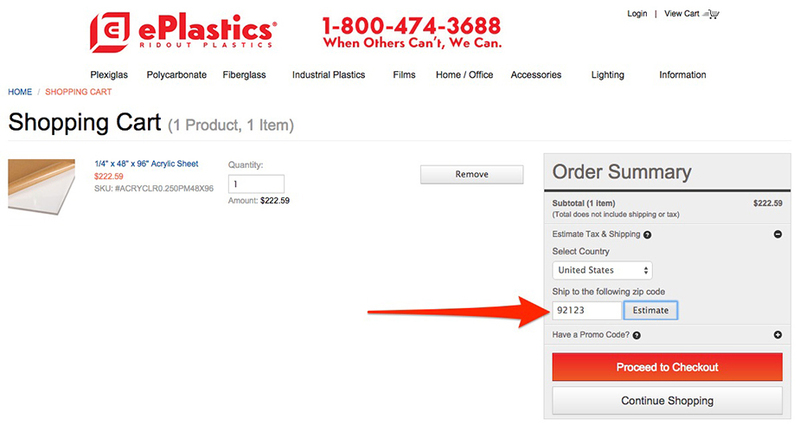 Simply enter the country and zip code of your delivery address, then enter click on Estimate to proceed (see image below). Select the appropriate ship method based on the size of the largest item in your cart (see image below). All California delivery zip codes will offer an option for will call pickup, so make sure you select the correct shipping option if you are not arranging to pickup your order. Picking the wrong ship method will delay your order. 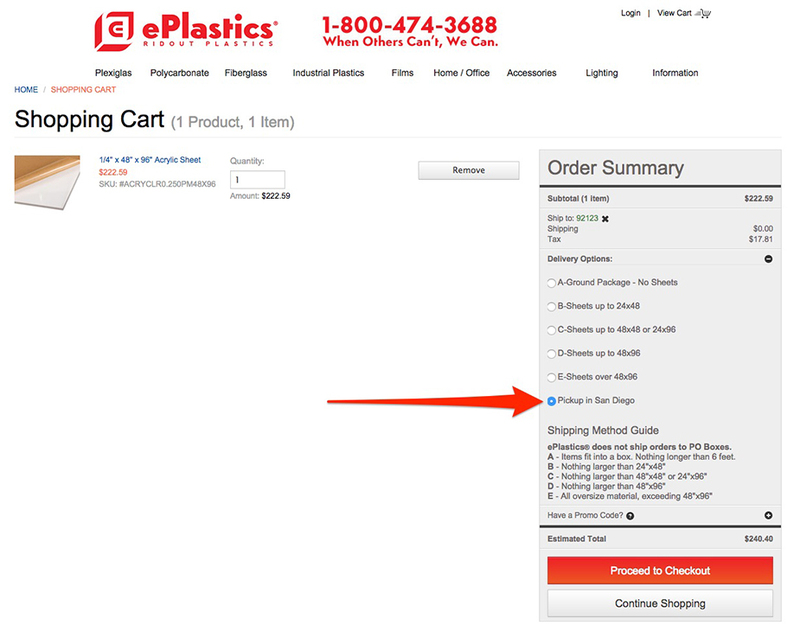 If you have questions regarding the shipping sizes, email orders@eplastics.com or call our staff at (800) 474-3688. Click "Proceed to Checkout" to begin the final steps of checkout. At this point you will need to sign in to your account. If you left products in your cart without purchasing during your last visit, then it might appear with your new items during this visit, so be sure to review your cart after you sign in. Once you login to your account you can see the current status of your order, see all past orders, update your contact information, and more. Once you are logged in you will need to verify your shipping information. Click Edit Address if you want to change the address that is currently displayed, or click Change Address to add a new shipping address option (see image below). If you a new registrant, you will need to follow the steps to enter your shipping information in the fields provided (not displayed below). 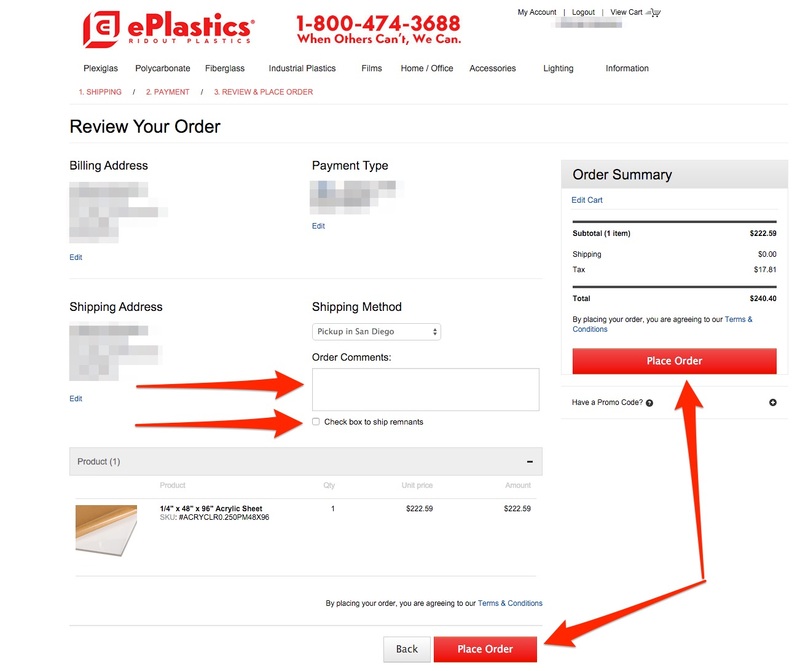 After you verify shipping info, you will need to verify (or enter) your payment information. Click Edit Card if you want to change the address that is currently displayed, or click Change Card to add a new payment address option. After you verify the card, you will need to input the Security Number in order to proceed to the next step (see image below). If you are a new registrant, you will need to follow the steps to enter your payment information in the fields provided (not displayed below). You still have one more step to verify your information before submitting the order. 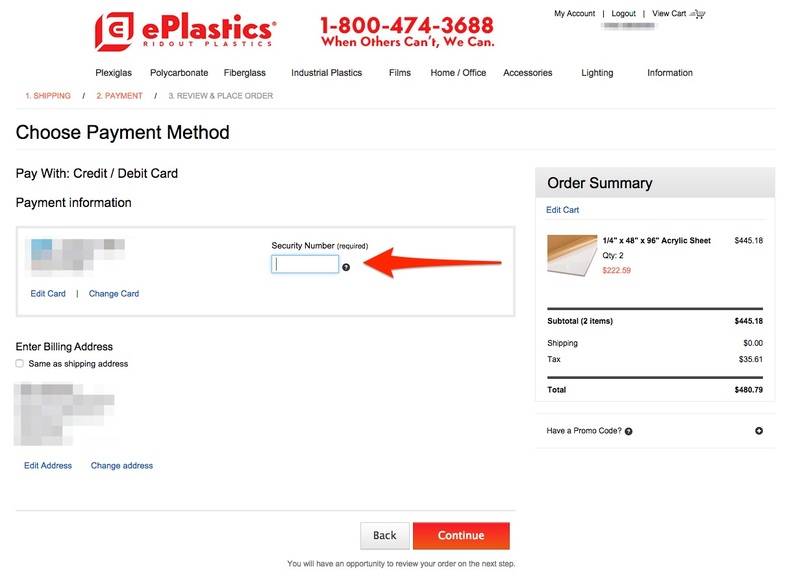 This is the last step before your order is sent to ePlastics® and your card is charged. Use this page to verify all of your order details. After you are done with that, the order will be placed exactly as you see it there. If you need exact sizing, expedited shipping, special delivery instructions, or any other information that we may need to know then you will need, then enter them as detailed as you can in the Order Comments box on this page (see image below). If your order is being fabricated, and you would like the pieces that are cut off, then click box labeled "Check box to ship remnants" just below the Order Comments box (see image below) and we will deliver them with your order. Keep in mind, if there are a lot of remnants, then your order might weigh more than originally anticipated. If you have a California address, then sales tax is automatically added to your order. If you have a valid resale certificate, then please state so in the Order Comments box, and then fill out this form to have tax credited back to your order. Instructions for form submission are listed on the form. 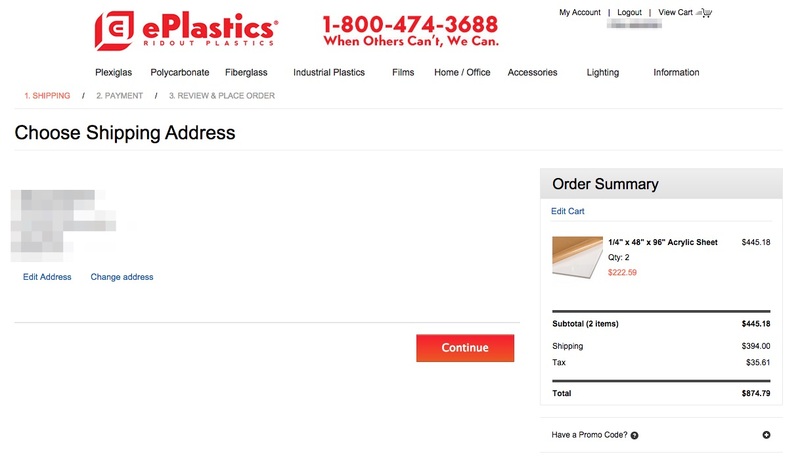 After you submit your order it will immediately be sent to ePlastics® and you will be emailed a Sales Order Confirmation email. Orders are processed and shipped within 2-3 business days. Cutting adds one extra business day to the process. Orders placed on a Friday, Saturday, or Sunday will be processed the following Monday. Orders are processed and shipped within 2-3 business days. If there any delays you will be contacted via email within 48 hours of placing your order (weekdays only) or as soon as we are aware of the delay. 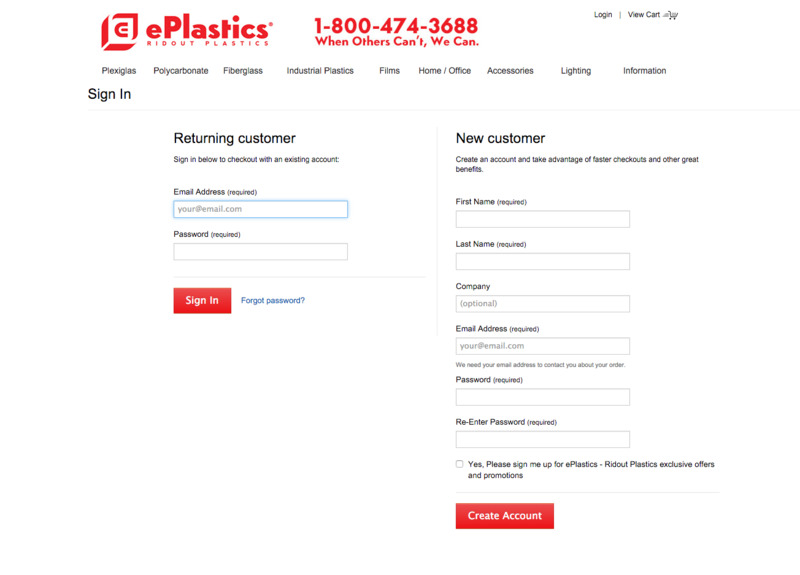 If you have any questions or comments about your order, please call (800) 474-3688, or email orders@eplastics.com and reference your Sales Order number for more information (Sales Order numbers begin with SO-). To read more information about ePlastics® shipping regulations, click here.